One thing that Me-made May is showing me is that I’m pretty good for dresses and tops in my wardrobe, but I still don’t have many options for spring-appropriate lower half separates. I’m not a particularly cold-blooded person, so when the weather gets anywhere above 20 degrees I’m much more comfortable in floaty clothes with a bit of skin out. Over the last bank holiday weekend I bashed out these three skirts using stash fabrics… they’re all the same pattern but I got a lot of different looks for no money at all. The Ilsley skirt is a free (freeeee!) pattern from the lovely Marilla Walker. It’s one of those magic patterns to me that’s basic but a bit special too – the yoked pocket and curved hem detail definitely takes it away from ‘gathered rectangle’ status. 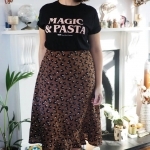 I’ve found Marilla’s drafting to be really excellent and perfect for my body shape, and the final bonus is this skirt only takes 1 metre of 54″ wide fabric. Winner? Winner. For my first version, using a leftover scrap from my Style Arc Fern top, I was a bit worried that the straight shape was too far out of my comfort zone so I slashed and spread the pattern a bit to add more volume at the hem like so. I added a couple of inches to the length and left off the pockets too just to test the shape. I really liked how it came out – swishy and swingy! Though I didn’t really need the extra length or volume at all; I went back and removed about half of it for the next version. 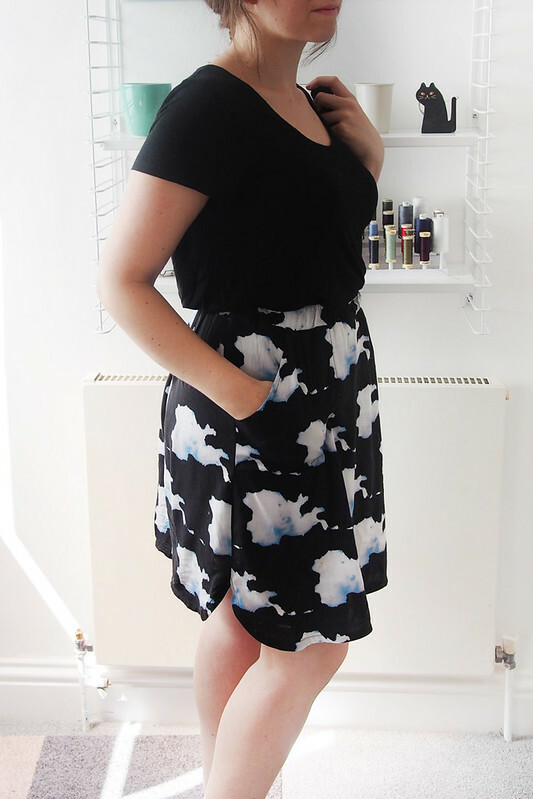 This one uses a yummy ex-Vero Moda (isn’t it fun to find brand cast-off fabrics?) viscose found in Walthamstow. 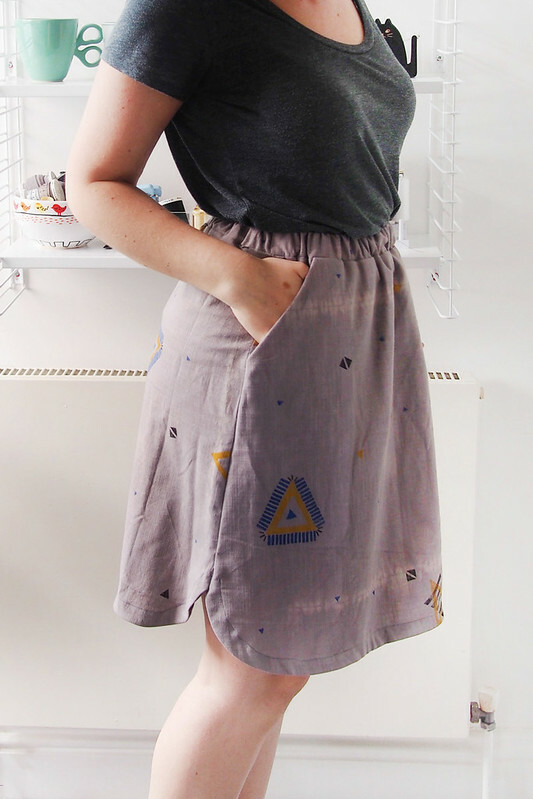 I LOVE the Ilsley in a drapey fabric – I was inspired by this Madewell skirt – and this is an utter dream to wear. It feels pyjama-comfortable and weightless and the fairly straight shape means it doesn’t fly about in the wind. Dream skirt. I took a tip from Meg and topstitched the pocket facings directly onto the skirt front to make it as light and floaty as possible. I found it tricky to hem the curves on my first one, so I used bias tape on the hems for this one. 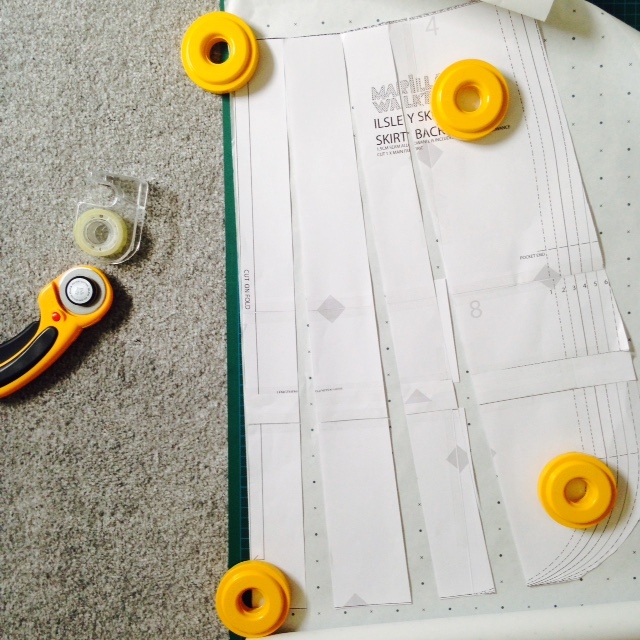 The only other small tweak was to make the waistband pieces about an inch narrower to suit the width of elastic I had to hand. Finally, I used up some special fabric: if you remember the hand-printed fabric swap that Marilla herself organised a while back, I received this beautiful hand-dyed and printed cotton linen from Lucy. I’ve been hoarding it ever since, unsure how to make the most of it, and ended up using nearly every last scrap, including some self-bias to face the hem. A trio of lovely skirts for MMM and beyond! These skirts are lovely and so cool for the summer. My favourite is the swingy one and the hem is just fab. They are such great stash busters, I need to do some stash busting rather than keep buying more and more fabric! Easier said than done. Wow! 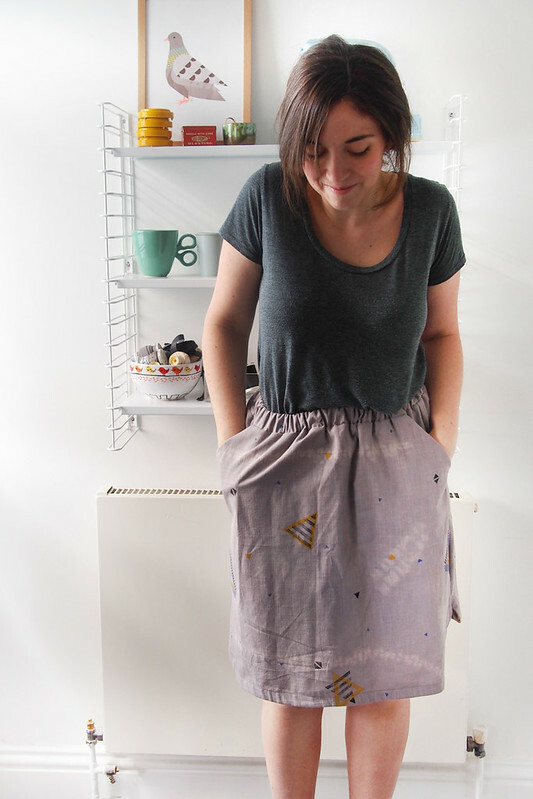 You’ve done really well with creating 3 skirts so quickly and out of leftover fabrics. I will have to try this one out. 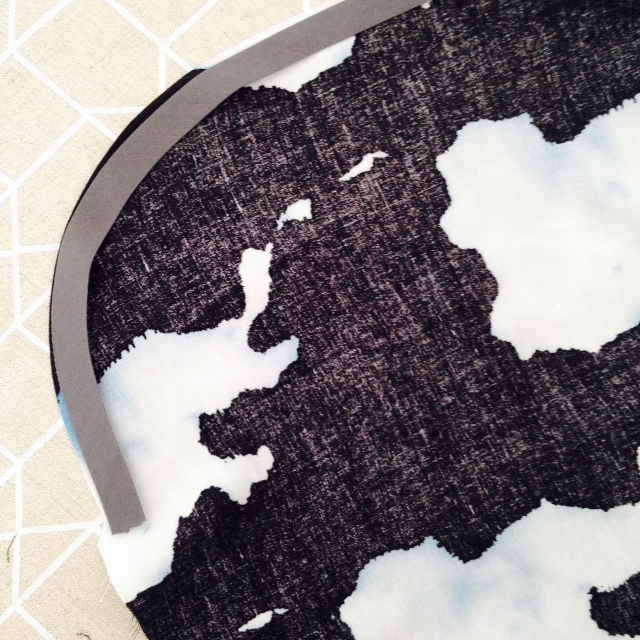 I don’t know which fabric I love more – maybe the hand printed one as it’s one-of-a-kind! Its an almost instant gratification project! I love the skirts, they look great! I love the first one especially! Linen would be a lovely choice, I think I’ll try that soon. This are all really cute and I’m sure you will get so much wear out of them for the summer months! I love all your fabric choices too! I reckon I will too! Haha I love how you also think that shopping from stash or leftovers = free! I’m quite certain that once a piece has been in my stash for a period of time it absolutely cost me nothing! Lovely skirts for summer. These look great! Now I want to make the Ilsley out of a flowy fabric, too! Do it! I’m looking for some solid washed silk so I can full-on copy the Madewell version. The last skirt is THE dream. Love the pattern! Fun, isn’t it. Glad I could put the lovely fabric to good use. Gah! They’re all so cute and you’re right, just a simple pattern but the cute details like the curved hem and pockets make it special. I think the middle one is my fav! LOVE this skirt – the side detail is amazing. And the fabric (especially the last one) wow! I’m running over to print the pattern now! These are all so cute!! Great fabric choices for all three as well – I can see them getting a lot of wear. These are darling! You have the best everyday wardrobe! I really think I’ve liked every single garment you’ve ever made. Your new skirts look very cute and perfect for summer!